SISTERS, OR -- The Deschutes National Forest is moving forward with plans to remove dead and dying trees from along Highway 20, west of Sisters. They were killed by an herbicide used by the Department of Transportation between 2013 an 2015. Jean Nelson Dean, with the Forest Service, says the project is a top priority. "We want to get all of the NEPA, all of our planning wrapped up so we can complete that project this spring. And, I think we’re on track to do that. It’s critical that we get it done as soon as possible. We don’t want to risk anybody having a tree fall on them," she tells KBND News, "I don’t want to scare anybody; we’re on top of it. But, it is a real priority to get all that work completed this spring." ODOT brought down nearly 90 of the most dangerous trees last fall. Nelson Dean admits the Forest Service still needs to remove around 2,000 more from along the side of the scenic highway, "It is a lot. I think, as you see that spread out through the corridor, it will still be beautiful." Oregon’s Department of Agriculture is considering a permanent ban on the use of the herbicide at fault, in rights of way. 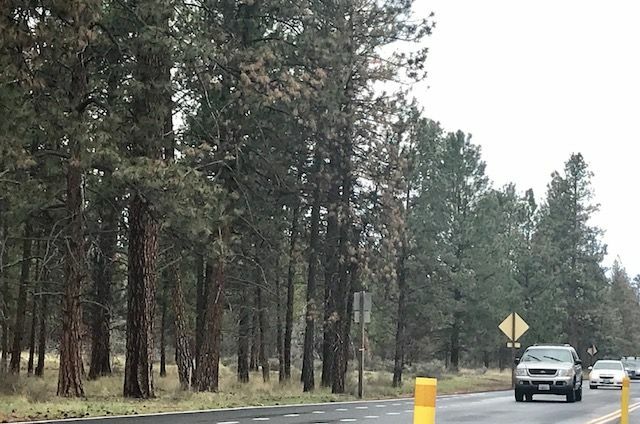 A public hearing on that proposal is scheduled for Bend on February 15 at 6 p.m., at the Deschutes County Road Department. Photo of dead trees on Highway 20 west of Sisters, April 2018.